In early Autumn of 2016, I headed up to one of my favorite places for fall color, Eunice Lake and Tolmie Peak, on the northwest side of Mt. 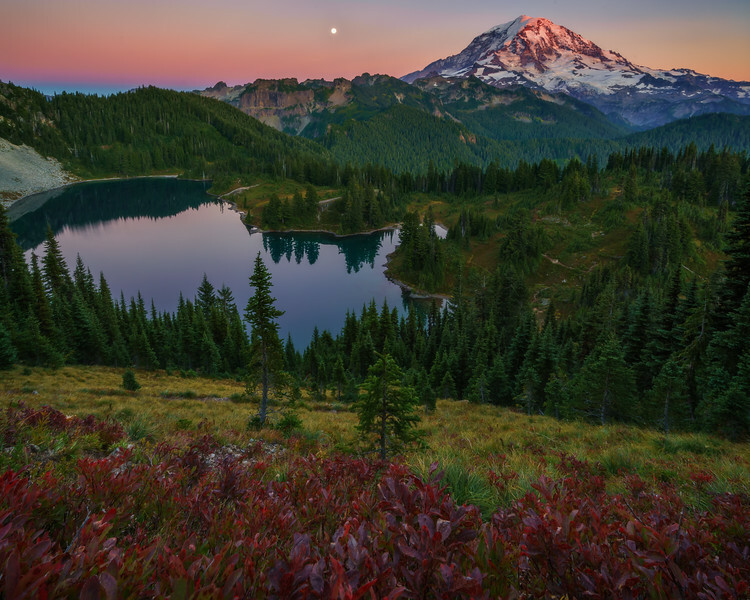 Rainier National Park, accessed through the Mowich Lake entrance. I had been at Mt. Rainier the week before and there was little color, but everything changed in one week, here Fall Color was definitely on the rise! I stayed until well after sunset and here is one of the images from that evening with light from both the sun that just disappeared below the horizon and the rising moon. Experiencing the changes in the light as the moon rose was an experience that was spellbinding, with each passing couple of seconds the light would change transforming the landscape into a wonderland of reflected light, warm glowing colors, and extraordinary depth.